Last week probably marked the most important week of the year for all IEM user: the highly anticipated, long overdue Westone 3 has finally been released to the market at the 28th of November. 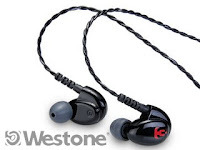 For those who didn't keep track of thing, Westone 3 was first announced at January 2007, which means it took almost 2 years for Westone to actually bring the prototype to live. During all these time, Westone had shown and all0wed people to demo the prototype on multiple meetings. Needless to say, the impression seems to overwhelmingly positive. In any case, the impression fueled hype is now over and the IEM will be judged more openly by the public eyes ears. With more and more reviews being posted all over the world, we shall soon to see whether Westone 3 will become the stuff of what legend is made of or not. Perhaps it will even set a new standard of what to be known as 'the best of universal IEM.' I am sure Westone's main competitors like UE and Shure is keeping an close eye. The question is, would they do anything about it? I certainly hope so. Other IEM that make their debut in the last week or so are the s-JAYS from JAYS@Sweden and Audéo PFE (“Perfect Fit Earphones”) by Phonak@Swiss. The s-JAYS utilizes a kind of rounded (instead of the more common box-shaped) balanced armatures transducer named 'Siren' which I believe is made by Knowles, one of the largest balanced armature transducer manufacturer in the world. On the other hand, the Audéo PFE from Phonak has a single drived, sideway mounting balanced armatures transducer that seem to resemble the TopFire transducer on UE's new Super.fi 5. Just proves that you can't keep a good idea all to yourself. Westone 3, the first true universal IEM that deploys three balanced armature transducers with a three-way crossover network. MSRP US$399. Features: Soft padded travel case, ten different eartips, and wax loop for cleaning. 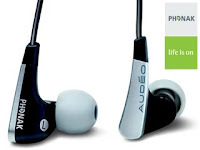 Phonak Audéo PFE, the first attempt from the hearing aid maker to break into the IEM market. MSRP US$139. 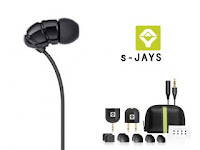 s-JAYS, a new offering from JAYS that targeted at the lower end IEM market. It comes with an unconventional 'Siren' transducer (and the earpiece design looks rather interesting). Strange enough, I can only find it on JAYS' UK website. MSRP £64.97. FiiO E5, the BIG little amp. Neutral vs. Natural: A Thought.